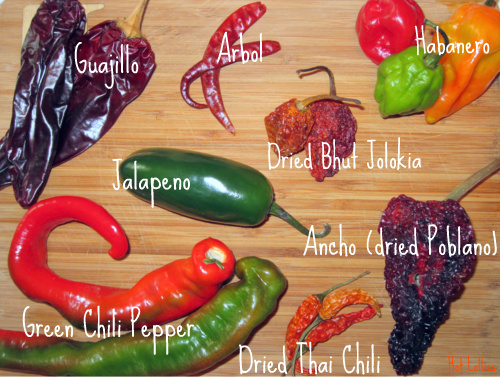 Get to Know Your Hot Chile Peppers! Ever walked by a gorgeous display of peppers at your local farmers market or grocery store and wonder, “hmm those look great but not sure what to do with them” or just quickly move pass them? No worries, you don’t have to like spicy foods to enjoy the flavors in hot peppers. Some of the hottest peppers in the world have a sweetness to them…ahem, if you get rid of the spicy stuff inside. Hot chile peppers pack an incredible amount of flavor and knowing your peppers and picking the mild from the hot, and the hot from the hellfire will help you enjoy the peppers that your palate can handle. There are so many varieties of peppers so I thought it would be a great idea to identify a few of them for you. I hope you will find it useful. Ancho (dried Poblano): Very mild, large chile. Can measure 3 inches across and up to 6 inches long which makes them great for stuffing. Green Chile Pepper: Also a mild chile pepper used in a variety of Mexican dishes and similar in heat to the Poblano. These are large and green and turn red when ripe, although heat is still the same. These look similar to the Anaheim peppers and would be great for pickling. Guajillo (dried Mirasol Chile): This mild chili can be stemmed/seeded, ground up in a coffee grinder and used as a smoky chile powder. Also great for making sauces and dry rubs. Jalapeno: Probably one of the most ubiquitous of all peppers. The dried version is called a Chipotle pepper. These range from mild to hot. Hotter than a Poblano but much milder than a Cayenne. Great in sauces, toppings, infusing in liquors, really endless uses. Arbol (or De Arbol): Very similar in heat to the Cayenne pepper and Pequin pepper. They’re called “de Arbol” which is Spanish for “tree like” because stems look like trees and flavor is earthy and woody. Thai Chile: Very hot chile used in Thai cooking. I sometimes crumble the dried chilies and sprinkle in soups or chili when I want pure heat but not much flavor. The fresh versions are used in fish sauces, Thai curries and a variety of other Asian dishes. There are other regions of the world that also have similar peppers. Habanero: Very hot peppers with a distinct sweet flavor. Very similar in flavor and heat to the Scotch Bonnet pepper. You should wear gloves when handling these or wash your hands immediately after. Can be used in sauces, curries (Asian & Caribbean), sweets, pretty much anything. These are my all time favorites! Bhut Jolokia (aka Naga Jolokia or Ghost Pepper): This was considered one of the hottest peppers in the world up until a couple years ago when the Trinidad Scorpion Butch knocked it out in the Guinness World Records. However, the last I read on this, there have been many others like the 7 pot and the Moruga Scorpian peppers. These peppers are extremely hot, 6-8 times hotter than the Habanero! Caution when handling and using as too much will burn for hours!! Just check on YouTube if you don’t believe me. In saying that, I’ve tried the Moruga, although very little of it and flavor is similar to the Habanero/Scotch Bonnet just more blazing hot!! Pour ½ liter of good Vodka (Tequila works as well) into a glass pitcher. 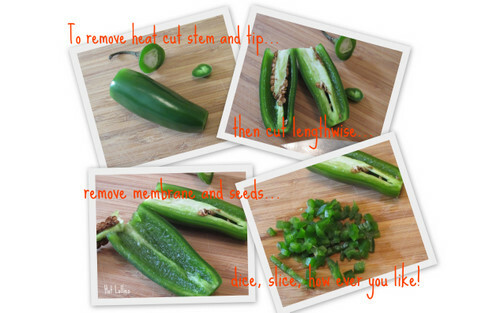 Stem a jalapeno and cut lengthwise and drop ½ of jalapeno into vodka. Let vodka sit (no need to refrigerate) for at least 6 hrs or overnight. The longer it sits the spicier your vodka. Strain vodka when ready to use...you don't want seeds in your drink! Place in freezer to get it nice and cold and enjoy neat or on the rocks. Before the holidays are over I’ll share a few drink recipes I make with this spicy vodka. Again, if you don’t like the heat in any recipe, you can easily remove the insides (membranes) and enjoy the great flavor of chile peppers! FYI: The heat of a pepper (levels of capsaicin) is measured on the Scoville Scale. The scale indicates how hot a pepper is based on it’s Scoville Heat Unit (SHU). The lower the SHU the milder the pepper. For example a bell pepper has zero SHU, a jalapeno has between 3,500-8,000 SHU and Habanero about 200,000-350,000 SHU….get the picture? If you really want more details on these ratings and the ratings of other peppers check out this great diagram at the Eat More Chiles site.